The In Flight Mighty Wallet, bi-fold style! Now Boarding! The cool and sometimes comic graphics in airline safety manuals are recognized internationally. Dynomighty pays tribute to this classic design with there own “Mighty Air” in flight safety manual. The Mighty Wallet has been “Flying high since 2005″. The In Flight Mighty Wallet is designed from a single sheet of super strong Tyvek that is virtually indestructible and is 100% recyclable. The Mighty Wallet holds approx 16 credit cards, has two interior pockets for cash or receipts and two side pockets for quick access. Tyvek Mighty Wallets are environmentally responsible, with 25% of their composition coming from recycled milk and water containers. Mighty Wallets are also 100% recyclable! Ask yourself – What do you want from a wallet? Light and strong? Thin and expandable? Tear and water resistant? Recyclable? Perfect for scannable cards such as oyster cards (no need to take out of your wallet)? If these are the sort of properties you demand in a wallet then the Bi-fold Dynomighty Design Tyvek In Flight Mighty Wallet is the one for you! Designed by Terrence Kellerman, the In Flight bi-fold folded design allows the wallet to expand gradually as needed providing you with more room. The Tyvek will wear in, soften and patina with use but remains tough. 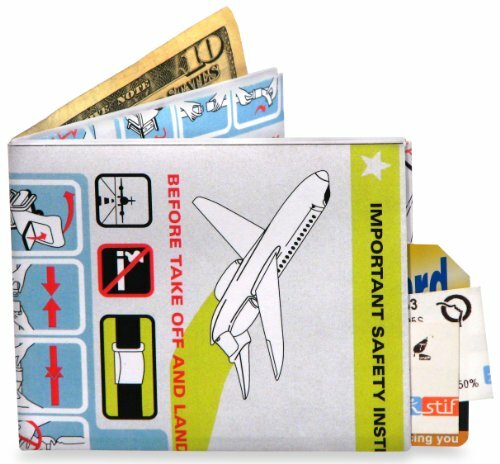 The tyvek is printed with the spoof graphics of airline safety manuals to disguise the wallet, giving an added degree of stealth. All these properties give you an amazing wallet that is lightweight, strong, long lasting and super thin.What is Tyvek? Tyvek feels like paper but it is actually made of thousands of long plastic fibres creating a surface that is both lightweight and durable yet super thin and tear resistant. Tyvek is also water resistant and will protect against the humidity in your pocket which can destroy leather. When open the In Flight Tyvek Wallet measures approx 8″ W x 3.25″ H x .125″ D.The In Flight Mighty Wallet, bi-fold style!